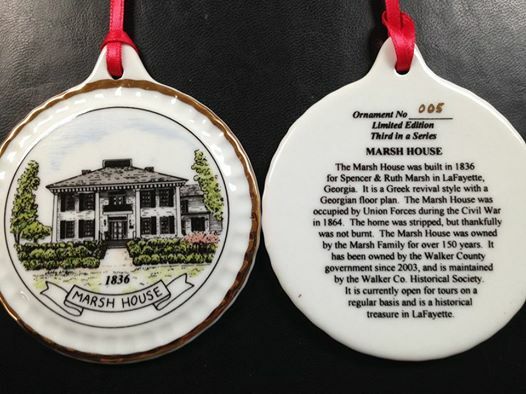 The 2014 Marsh House Christmas Ornaments are here! These porcelain ornaments are all limited edition, and are all hand numbered. This is the 3rd ornament in the set of Lafayette’s historical Christmas ornaments. The prior two ornaments ar…e of Gordon Hall & the Presbyterian Church. All 3 of these history filled sites were built in 1836. These ornaments can be purchased for $15 a piece, or $40 for the set of 3 ornaments. Get your ornaments while they last at the Walker County Welcome Center (across the street from the Marsh House) or at Debbi’s Flowers on the square. The ornaments will also be on sale at Gordon Hall during the model railroad & village display from 6-10pm on December 5th, 13th-31st nightly. These ornaments are a DDA project, and all ornament proceeds go back into DDA projects in your community.